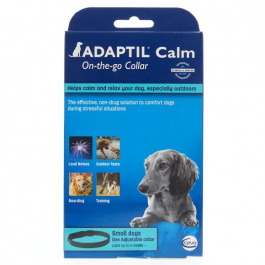 Keep calm and play on with the Adaptil Calming Adjustable Dog Collar. The innovative design is activated by body heat, and it releases a constant calming pheromone that helps put dogs at ease during any stress-triggering situation. Whether it’s a thunderstorm rolling in or you have to take your pup to the vet, this collar helps put your dog’s anxiety at ease. A great alternative to uses drugs or supplements, this collar is clinically proven to work and recommended by veterinarians. It’s essential to keep the collar in close contact with the skin at all times, so keep it on continuously and use for at least 30 days. Remove the Calming Collar from wrapper. Remove the separation band using pull tab according to the instructions on the package. Buckle the collar around your dog's neck, allowing two fingers of space between the collar and your dog's neck. The Adaptil Calming Collar must be close to your dog's neck to be activated by your dog's body heat.